In my knitting stitch travels, I've come to realize one great truth. We need to ALWAYS knit a SWATCH. Even a scarf can be tricky, if you're using a stitch pattern that sends your stitches in weird directions. 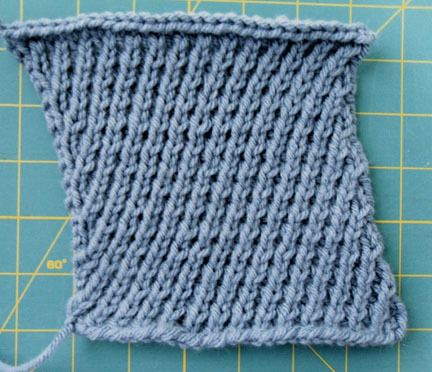 Now, personally, I love the "Rib Diagonal Stitch" Pattern. It's a beautiful pattern, and it makes great diamonds GOING DIAGONALLY! Still you could make a bunch of diamonds and sew them together, I guess. However, the point is, it doesn't work for most knit patterns. You would have to compensate by adding and deleting side stitches, to keep it straight. Something I'll have to look into, at a future date. 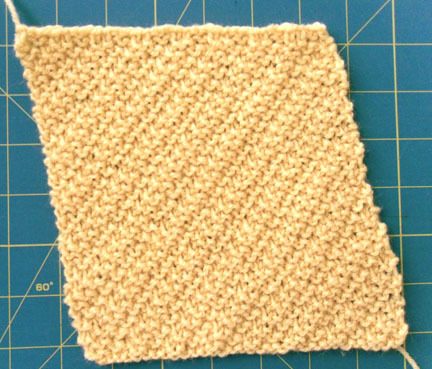 The "Diagonal Stitch" pattern is another matter, all together. It seems to travel everywhere, and not equally. I don't know how you could compensate for that. It's always bothered me, that you have to stretch and pin knitted pieces, to get them to conform with pattern schematics. It's a pain, when they're in pieces, but after being sewn together, worn and washed, it's an even greater pain. Some stitch patterns are just difficult to work with (as seen above). They are legitimate stitch patterns, but should not be used in very many applications. They should be labeled "knitter beware". So I have become a firm believer now. I hope I've convinced any non-believers out there. * You're using a new stitch pattern. Don't assume the photographs are a true representation of the pattern outcome. They may have been drastically stretched. * You're using an old pattern with the same yarn you've used before, but it's in a different color. Dyes effect the yarn, and can make it react differently than the same yarn in another color. * You're using an old pattern with the same old yarn, and the same needle size, BUT a different set of needles. Again, different needles, different reactions to yarn, and possibly a different gauge. So, in other words, you can only get by without a swatch, if you're knitting the same pattern, in the same yarn and color, with the same needles. But swatch, anyway!